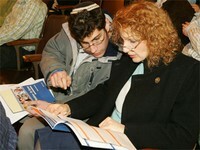 Nov 15, 2005 — More than 500 high school students and their parents visited Yeshiva University’s Wilf Campus on Sunday, Nov. 13 to learn about YU’s programs for men, including Yeshiva College and Sy Syms School of Business. Speakers at the event included YU President Richard M. Joel; newly appointed Yeshiva College Dean David J. Srolovitz; and interim Sy Syms School of Business Dean Ira Jaskoll. Sessions included an overview of the schools’ Judaic studies programs, information on financial aid, and a discussion of the Jay and Jeanie Schottenstein Honors Program. Students and parents had a chance to meet with faculty and alumni and to tour the campus. Special sessions were also held about the S. Daniel Abraham Israel program, with Dr. Hillel Davis, vice president for university life, giving a presentation for parents, and Mark Lehrman, director of the S. Daniel Abraham Israel Program, leading a discussion for students. Students and their parents were also treated to a tour of a dorm room and a sneak preview of the Mendel Gottesman Library’s new Albert Einstein exhibit. YU will be having an open house for women on the Israel Henry Beren Campus on Sunday, Nov. 20. Information on that event is available here.